The United States delegation was the last country to present an overview of its work. 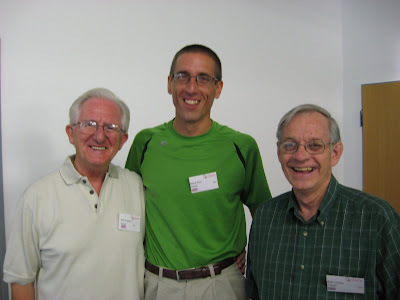 Robert Wagner (left) from Calvert County, Maryland, reported on churches and work in the eastern U.S. Steve Kern (center) of the Wooster, Ohio, Grace Brethren Church, reported on church-planting and other ministries in the central U.S., and Bob Combs (right), of Norton, Ohio, presented the work of the Grace Brethren in the western United States. Perhaps the high point of the conference occurred in the late morning Friday when the assembled delegates, in a meeting coordinated and led by Florent Varak of France, voted unanimously to adopt a document which is a declaration of action for Grace Brethren worldwide over the next several decades. After much discussion and adjustment of wording, in three languages, the final documents presents biblical positions and aspirations for Grace Brethren work worldwide in three areas: church planting, leadership training, and integrated mission. As delegates leave Bad Homburg, part of their responsibility will be to explain this document and its intent, and to help churches in their part of the world implement the larger vision of impacting the world for Christ in these three areas. Delegates will have some free time Friday afternoon for sightseeing in Frankfurt, and official activities will conclude with a threefold communion Friday evening at 5:30 p.m.